During our garden tour last May, one plant that attracted the most visitors in my kitchen garden was Moringa. Moringa Oleifera is also known as the tree of life to many people in the world, containing more than 90 nutrients, including 40 antioxidants. It is the world's most nutritious foods on earth in one tree. While growing up India, it was common to spot a moringa tree in many backyards. It is also known as drumstick tree because the young pods look like drumsticks. Every part of the moringa plant is used. Moringa pods are commonly used in soups and curries. 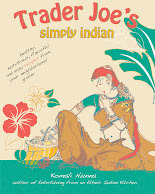 The leaves and flowers are used in many curries. The bark, sap, roots, leaves, flowers and leaves are used in many traditional medicines. Even though this plant is relatively new to the Western world, it has been well known in Indian Ayruvedic medicine for its anti-bacterial, antifungal, antviral and anti-inflammatory properties. According to India's Ayurvedic medicine, moringa cures more than 300 diseases. Modern science is confirming this traditional knowledge. Moringa leaves are scientifically proven to reduce diabetes and high blood pressure. The World Health Organization is advocating that moringa is a solution for overcoming the world's malnutrition. Moringa leaves are the most nutritious part of the moringa plant. This is how moringa looks compared to some of the common foods. 100 grams of moringa leaves contain 28 mgs of iron, which is equivalent to eating 7 ounces of chicken or 9 ounces of beef tenderloin. Moringa leaves contain all 9 essential amino acids, including two amino acids that are essential for childrens' diet. Now you do the math, isn't it the worlds best food especially for vegetarians? I am pleasantly surprised to see that moringa is slowly catching on in Western society. Check for these leaves in health food stores and farmer's markets. You can find moringa capsules online. Moringa leaves are best to add to your morning smoothies and salads. If you heat moringa to 118 degree Fahrenheit, it looses some of its nutrients. Now I am sneaking moringa leaves into all my family meals. Since the leaves themselves don't have much flavor, they can be easily adoptable in many dishes. I think that it is important to get acquainted and educated about this super green. I hope the new food trend will be moringa. 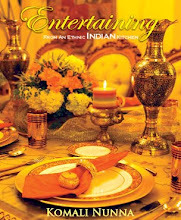 For more memorable centerpieces, tablescapes, and recipes (including vegetarian, gluten free and vegan recipes),,please check out my books, Entertaining From an Ethnic Indian Kitchen and Trader Joe's Simply Indian at my website komalinunna.com. So informative! I had no idea! Thanks so much for sharing! Found you on Foodie Friday! Oh Yes.. I've heard that its a super food too.. and supposedly cures a lot of ailments as well. Lovely post! !